In the 1800s, beer was a safer, more sterile beverage than milk or water, and people drank it daily. Until electric refrigerators chilled bottles, all beer was brewed locally and sold from the tap. 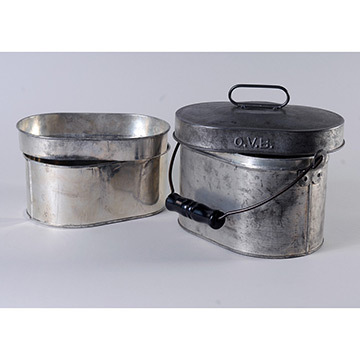 In the United States from the 1880s to 1920, when Prohibition ended the legal production and sale of alcohol, the midday factory whistle signaled a meal and beer break for laborers. 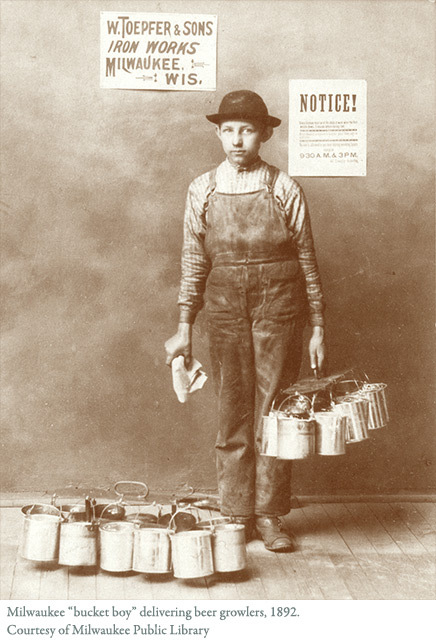 The origin of the term growler is unclear, but groups of young boys stood ready to collect the workers' lunch pails and "rush the growlers" to be filled at the corner saloon for the thirsty men. 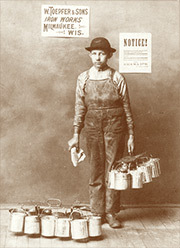 The boys carried many brimming buckets at one time by hanging them from a pole. This two-part growler could hold both food and drink, so its owner could eat while he waited for his beverage. He might rub fat on the inside of the pail to reduce the foam on the beer and get a better fill. 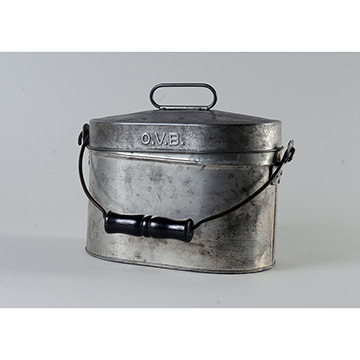 The pail is stamped "O.V.B." for "Our Very Best" brand.